John F. Kennedy International is one of the nation's busiest airports, handling 48 million passengers each year. (CNN) -- Flights resumed this week on the longest runway at New York's John F. Kennedy International Airport after a four-month closure for construction to help reduce future flight delays. The $348.1 million Bay Runway project was completed within budget and ahead of schedule, according to the Port Authority of New York and New Jersey. 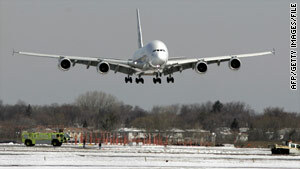 Work on more than 10,000 feet of the 14,572-foot-long runway was completed during the closure. The remaining work will be performed in two phases in the coming months. "[It's] on schedule, on budget and delivering a product that will have an immediate, tangible and lasting impact on the traveling public," said executive director Chris Ward. The runway has been resurfaced with concrete expected to last 40 years, replacing an asphalt surface applied in 1993. The project also added exits and access taxiways to the runway to speed aircraft takeoffs and landings and reduce delays. These measures are expected to cut delays by 10,500 hours a year, according to the Port Authority. From January through April, more than 20 percent of Kennedy's arrivals and departures have experienced delays, according to figures compiled by the Bureau of Transportation Statistics. The Bay Runway handles about a third of the traffic at Kennedy, one of nation's busiest airports with 48 million passengers passing through each year. "The project represents a vital infrastructure investment that will boost our economy by making the region a more accessible and desirable place to live, work, and do business," New York Gov. David A. Paterson said in a statement. The project was funded by the Federal Aviation Administration, the Port Authority and a $15 million investment obtained through the American Recovery and Reinvestment Act.